With their patented LED-retrofit method, the Danish company Fischer Lighting has made it easier and cheaper to integrate new, environmentally friendly LED-technology into old lighting solutions. When using the LED-retrofit method, a custom-made unit is inserted into the existing fixture. This unit makes it possible to install the latest LED technology directly, without having to change the entire fixture. Additionally, all of Fischer Lighting’s solutions are developed around changeable sub-elements, making it possible for future LED-technology to be installed the same way. The LED-retrofit unit can be installed in almost every type of existing fixture on the market today. This makes it unnecessary to replace fully functional lamps with new ones. Furthermore, by installing new LED-technology, the energy usage is lowered significantly and life expectancy of the existing lighting solution is extended. After finishing the upgrade, Fischer Lighting sends the replaced electronic parts to the Danish recycling company DANWEEE for upcycling of the reusable parts. Fischer Lighting’s LED-retrofit solution has already been used everywhere from Danish hospitals to educational facilities. Today, the patented custom-made unit is an integrated part in a whole range of products. At Køge Hospital, Fischer Lighting’s method was used in hallways, resulting in energy savings of around 63 per cent and an overall saving of around USD 30,500. Fischer Lighting’s LED-retrofit method reduces the amount of waste by extending the life expectancy on major parts of the existing fixtures. Furthermore, new LED-lighting solutions have a life expectancy of about five times as long as traditional solutions. Due to lower maintenance costs, this further reduces the amount of waste produced in the long run as well as the total costs of ownership (TCO). Fischer Lighting’s solutions are offered at competitive prices. From a short-term perspective, the costs of upgrading are significantly lowered because fewer materials are replaced. As an example, the Danish company Coloplast was able to keep their designer lamps in their cantina, making the renovation available at around one fifth of the price – compared to a total reinstallation of new fixtures. In a long-term perspective, Fischer Lighting’s solutions typically has a payback time of around one to five years. Moreover, the solution reduces the buildings’ energy usage by around 50 to 80 per cent, typically adding up to an annual return of around 15 per cent. Finally, Fischer Lightings LED-retrofit solution is a responsible, repairable solution, where better and more intelligent LED-lighting heightens comfort and reduces the overall CO2 emissions of the building. One of the biggest challenges facing reuse solutions, such as Fischer Lighting’s LED-retrofit method, is lack of understanding for the quality of the solution and the overall total costs of ownership (TCO). In other words, it is important that procurers have easy access to guidance documents that can help understand and calculate products’ long-term costs and quality. Fisher Lighting has calculated the additional cost over a 15-year period when purchasing discount luminaries instead of Fischer Lightings own retrofit solution to be around 1.4 million DKK if purchasing a 1000 pieces. To help public procurers to take parameters such as operating costs and energy use in to account TCO procurement manuals and tools should be more widely distributed. For inspiration see: www.csr-indkøb.dk. 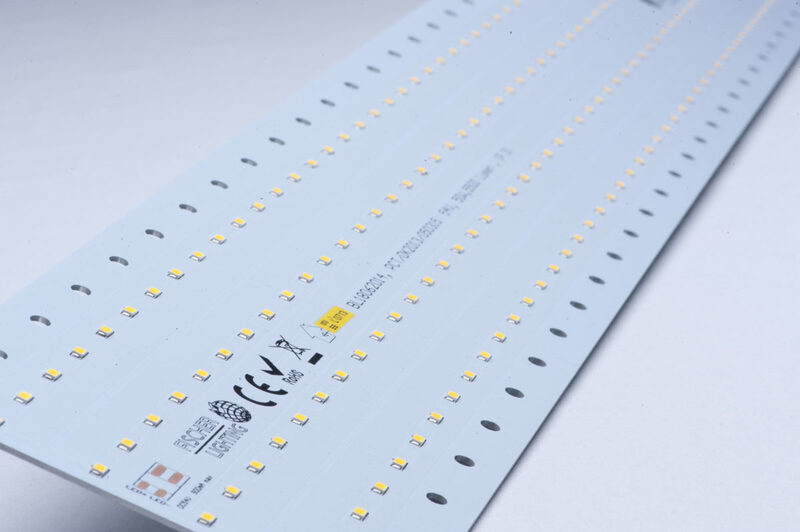 LED-technology is developing fast. Therefore, it is necessary to design solutions with changeable sub-elements making it possible to repair or update lighting solutions without replacing the entire fixture. Unfortunately, cheap, non-repairable solutions are still popular on the market. By recycling a 1000 pieces, you save up to 57% extra CO2 compared to buying new fixtures. Which corresponds to driving 37 times around the earth in a car. Another challenge relates to the current legislation regarding treatment and utilization of used plastics. Due to legislation and technical specifications, Fischer Lighting experiences difficulties in producing ‘rebuilding-kits’ out of reused material.